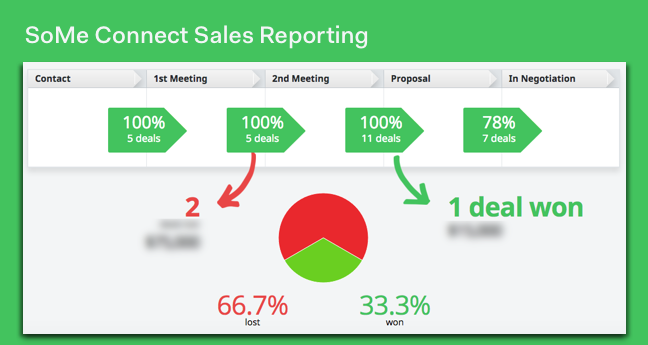 In early 2015, SoMe Connect began using Pipedrive to unify its business data and better manage sales activities. After a year, the company increased its close rate, shortened their sales cycle and more than doubled their annual revenue. The company cites Pipedrive’s intuitive user experience, visual representation of data and customizable features for these improvements. SoMe Connect is a Chicago-based digital marketing agency founded in 2011 by Aalap Shah and Madhavi Rao. While initially offering social media marketing services, the company has since broadened its scope to include content marketing and paid search. Its eight-person team includes a creative strategist, a community manager, a graphic designer and SEO specialists. Shah leads all sales and marketing efforts and Rao manages client services, internal operations and delivery. Shah describes SoMe’s internal culture as transparent, supportive and collaborative. Team members are encouraged to be direct with each other and their clients. "We spend a lot of time educating our clients on what we do, and I think that requires a lot of transparency," Shah said. SoMe’s culture of transparency supports its overarching objective: to be the best in class. In an industry where almost anyone can open up a social media shop, Shah and Rao have striven to maintain a relatively small client base to deliver high-quality services. “We want to be your strategic business partner more than just your marketing venture," Shah said. For the first three-plus years of SoMe’s existence, Shah went through more than 20 CRMs, including Salesforce, which was too complex; Excel, which was too basic; and Basecamp, which was not sales-focused. Some products weren’t visual enough. Others weren’t mobile friendly. “They just weren’t tailored to what I needed to do,” Shah said. In the first quarter of 2015,Shah stumbled upon Pipedrive and figured he’d give it a shot. This time, the CRM stuck. He was quickly struck with Pipedrive’s intuitive functionality and flexible reporting capabilities, and said that it thought the way that he — as someone in a sales/business development role — thought. "It adjusted to my tastes,” Shah said. “So if I wanted to throw in the deal with just a few details, cool. If I wanted to extensively add notes, cool. It worked for that too." SoMe Connect has two pipelines. Shah emphasized his appreciation for the following Pipedrive capabilities. Before using Pipedrive, SoMe had no single point of access from which to manage sales activities, project deliverables, leads, referrals and other key data. Various bits of information, like a ripped treasure map, were scattered across multiple applications such as Dropbox, Basecamp and Outlook, as well as Word documents and notepads. This lack of cohesion affected efficiency, timeliness, and led to miscommunication and missed opportunities. “I either had all the information in several different places, or it lived in my email. I’d miss an invite or a document,” Shah said. 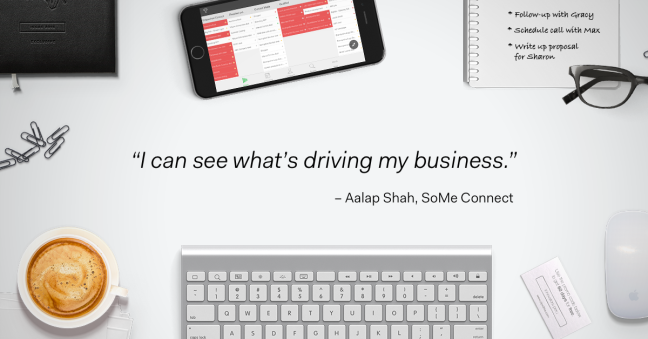 Pipedrive allowed Shah to unite each area of his business under one roof and “be organized in an official way.” He’s now able to visualize his pipeline, prioritize tasks, and retain necessary documentation, notes and other important details. As head of sales, Shah was busy with digital marketing initiatives, as well conferences, meetings and networking events. While he succeeded in turning many of these activities into business opportunities, he wanted a way to quantify those activities and establish a clear pattern between actions and results. By logging in every activity, maintaining his pipeline stages and analyzing his Statistics, Shah was able to unite all of his business activities into a single point of access, and develop a nuanced understanding of their outcomes. Quantifying his activities also allows Shah to identify where new business comes from — whether it be through SEO, referrals or networking events. “I can see what's driving my business,” Shah said. For a salesperson to keep all of their deals in perspective, their mind must be in the past, present and future simultaneously. This can be difficult, even impossible, to process fully. This was the situation before Shah began using Pipedrive: With SoMe’s data in different places and its sales statistics nearly nonexistent, it was difficult moving things through the pipeline, let alone remembering smaller tasks and opportunities such as staying top of mind with old clients, keeping up with deadlines and clearing daily to-do lists. “Pipedrive reminded me of all the opportunities I had in one place, so I could check in the morning and follow up,” Shah said. For example, every week Shah raids Pipedrive’s “Lost Deals” section and picks two or three companies to follow up with. 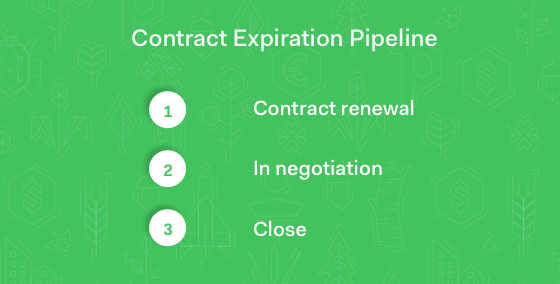 Shah also created a “contract renewal” pipeline to help him stay up-to-date on contracts. Unless he checks into Pipedrive every day and immediately logs in information, Shah knows he will not see Pipedrive’s full benefit. By keeping track of his leads, noting whom he does and does not follow-up with, and evaluating the outcomes, Shah has found that follow-ups are key to landing new business and closing deals. But while the timeliness of the follow-up is important, the emphasis should be on content over speed. "It's not necessarily how fast you respond, but the thoughtful response," Shah said. Shah is SoMe’s sole Pipedrive user, but he makes sure to share his pipelines with his team so they can plan for the capacity of each project. “They use my sales pipeline to see how the deals are progressing so they can figure out how to staff," Shah said. The length of SoMe’s sales cycle has steadily decreased from an average of 90 days to an average of 45 days. SoMe’s annual revenue has grown from $600,000 to $1.4 million. In 2016, Shah plans to take more advantage of Pipedrive’s many features and capabilities. For example, he will soon start a “check-in” pipeline to help smooth the transition process between sales and operations. "I have a lot of ambitious plans for Pipedrive this year,” Shah said.